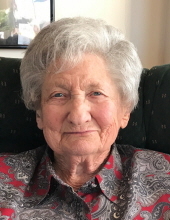 Lois Leggett age 95 of Columbus, Kansas passed away on Friday, July 13, 2018 in Rolla, Missouri. She was born in Bentonville, Arkansas on November 30, 1922 to Elmer Lee May and Walsie Mae (Bolin) May. Lois was a teacher in the Joplin school system for 30 years and a member of the Alba Christian Church. She is survived by her children, Stuart York and wife Alicia of West Covina, California, Wanda Lucian and husband Gayle of Rolla, Missouri, Kathy King and husband Galen of Columbus, Kansas, Glen Leggett and wife Lynita of Oronogo, Missouri, Donna Zumwalt and husband Greg of Hannibal, Missouri; 2 daughters in law, Phyllis Leggett and Debbie Leggett; 16 grandchildren, 32 great grandchildren, and 9 great great grandchildren. Lois was preceded in death by her first husband Edwin York on November 29, 1951, her second husband Lloyd Leggett in November of 2005; and two children, Melvin Leggett, and Tom Leggett. The family will be present for visitation on Thursday from 5:00 PM to 7:00 PM at Simpson Funeral Home in Webb City. Funeral services will be held on Friday at 10:00 AM at Christ Church of Oronogo. Graveside services will follow the service on Friday at 2:00 PM at Bentonville Cemetery in Bentonville, Arkansas. Contributions may be made to the Alba Christian Church in her memory. Services are under the direction of Simpson Funeral Home in Webb City. Visit www.simpsonfh.com for online condolences. To send flowers or a remembrance gift to the family of Wanda Lois Leggett, please visit our Tribute Store. "Email Address" would like to share the life celebration of Wanda Lois Leggett. Click on the "link" to go to share a favorite memory or leave a condolence message for the family.